A company director and his company have been sentenced to fines of £38,000 and costs of £33,000 in Nottingham Magistrates Court today after breaching conditions of an environmental permit over a 19 month period. The breaches led to a significant impact on the lives of local residents. Ryan Colson, of Westfield Avenue, Heanor, Derbyshire, is the director of Colson Transport Limited, a waste transfer company on Bulwell Lane in Old Basford, Nottingham. Colson and his company Colson Transport Ltd took over the site from the previous operators and the volume of waste passing through the site increased significantly. This led to dust escaping from the site and odour problems developed. This had a significant impact on the lives of the local residents, businesses and the primary school, located close to the site. Tim Pole, Prosecution Counsel on behalf of the Environment Agency, told the court that the failure to comply with the environmental permit and storing waste on site in inappropriate ways led to the significant impact on the community. In addition, Mr Colson had stored combustible waste on site. The consequences of a fire on site would have reached beyond the company itself, and could have impacted on other businesses as well as a primary school situated nearby. The Court was told that the nature, number and frequency of the complaints to the Environment Agency demonstrated the negative impact that the Mr Colson’s poor management of the site had on the lives of local residents. Colson Transport Ltd and its owner Mr Colson had a history of non-compliance and had received a written warning from the Environment Agency prior to the commencement of the Prosecution However Mr Colson failed to consistently operate the site in compliance with the Permit. Mr Colson and Colson Transport Ltd cooperated with the investigation and showed evidence of taking steps to remedy the problems on site. There was investment of approximately £350,000 into the site and there was an acceptance of responsibility. In sentencing the case District Judge Spruce found that the local residents had suffered because of the dust and odour problems emanating from the site, but there was no finding by District Judge Spruce that this created a risk to human health. The length of time that the breaches spanned was an aggravating feature and as was the history of non-compliance. However in mitigation the District Judge had noted the character references provided and found that Colson Transport limited was a responsible waste management operation. The District Judge found that there was no financial gain to Colson Transport Limited or to Ryan Colson as a result of the permit breaches. 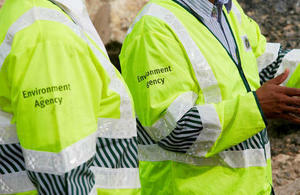 The Environment Agency works hard to protect people and the environment while supporting the vast majority of businesses that operate responsibly. This case demonstrates that we will take action against those who do not operate their business within the confines of relevant regulations. We hope this case will serve as an example and a warning for other operators to take their responsibilities seriously. We are determined to take actions against those who don’t.